Exfanding Your Horizons: Exfanding Review: Barry Ween! Sometimes, for various and sundry (sundried?) reasons, I decide not to pay any attention whatsoever to my friends when they speak. If you were to know my friends, then you'd understand what it is that I mean. However, there are cases where even my friends have their moments and the things they say do, indeed, make sense. Such is the case here, as, finally, I picked up Judd Winick's Barry Ween comic series. 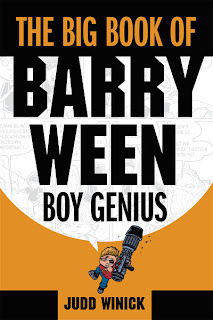 Released two weeks ago in a compendium edition by Oni Press, The Big Book of Barry Ween, Boy Genius collects all of Winick's Barry Ween stories. Barry Ween Barry Ween Barry Ween. OK, I've now officially said "Barry Ween" more times than anyone else on the Internet. Ever. AnyWeen, people have been trying to get me to pick up this series for years now, and I would always say something akin to, "yeah, sure, lemme run right out and grab that." I mean, it looked good and all, but I just had no real interest. And then I saw the big ol' compendium edition sitting at my LCS a couple of weeks ago. And I figured, eh, the price is right. So I bought the book, and fully expected to toss it on top of my "will read later" pile that is currently trying not to topple over from sheer height. Then, while waiting to leave for the BookExpo, I needed something to read and kill some time. Since Barry was on top of the pile, I grabbed it and started in on the first story. And I started laughing immediately. Now, I should say that, despite Winick's kid-friendly art style, Barry Ween is most certainly NOT a kid's book. In fact, it has some of the most creative swearing I have ever read in my life. And that's saying something. There's plenty of violence and adult themes, too, so don't read this to Junior before he goes to bed. Seriously. That said, the humor was right up my alley and there are honestly several laugh-out-loud moments throughout the series. Now, at this point in the review, there's a good chance that you might be asking, "who exactly is Barry Ween?" And, of course, as I am just plain awful at writing reviews, I really failed in that regard. You know, the whole "explaining things" part of the review. So, here goes. Barry Ween is the smartest human being on Earth with his 350 I.Q. And he's ten years old. What does Barry Ween do? Well, anything he wants, really. And the book follows Barry (and his best friend Jeremy) on some crazy-as-all-get-out adventures. Like the time Barry turned Jeremy into a dinosaur. Or when they discovered Bigfoot. Or when the CIA captured Jeremy, thinking he was actually Barry. Now, while comedy is certainly the targeted genre, Barry has its emotional moments, as well. The titular character is an outsider--there's just no one on Earth who could possibly match his intelligence. And as such, he plays the Lone Hero part quite well. And seeing very grown up emotions on the face of a very young child is downright powerful (and heartbreaking) stuff. Below is the cover of the Oni Press compendium that just shipped. 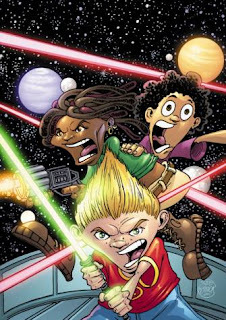 Oh, and, hey, if you don't wanna take my word for how great this book is, head on over to Oni's Web site, to this page, where you will find a FREE 28 page preview! What are you waiting for? I said free!